If you wish to hear this interview on the go, here is the audio version. People are willing to pay a fee for a qualified lead. It is really difficult to find real businesses that need real consultancies and agencies to help them build each other’s business and if there is a right way, there is no harm in paying a fee. Agencies don’t follow up enough after a proposal/pitch. It happens so often that an agency will email a proposal along with a PPT/DropBox link and just ask the clients to revert with any questions. Ideally, agencies should immediately schedule a follow up call after emailing their proposal to explain how it works and the results the clients are going to get from working with them. Clients should look for agencies who have experience in their vertical. Someone who’s done SEO for a B2B company and specializes in that space would require different skillsets than someone working on a high traffic B2C E-commerce shopping site. So it’s important to find someone who has some experience dealing in the vertical / business model of your site. Proposals with right expectations always win. Nobody can guarantee results in this industry but communicating the deliverables at every stage sets the tone. This gives immense confidence and trust to the clients. Educate the Customer. There are lot of business that doesn’t have strategy in place and so they are always reactive than proactive. It is important to make them understand what they are today and where they are going tomorrow so there are no surprises as we go. Validate your business model quickly and pivot, if necessary. His site started off as a lead generation model, which he stuck with for quite some time, before realizing that the strategy depended on “hope” that leads would convert and he’d get paid. Finally, the realization dawned, that it’s better to switch to a SaaS based subscription model where he’d focus on bringing traffic and exposure to the agencies listed on his site and they’d pay a monthly subscription in return. It took time to change and divert from the original ideas he had and he has learnt that mistakes are bound to happen and as long as you realize them soon enough and are able to fix it, you are in the right direction. 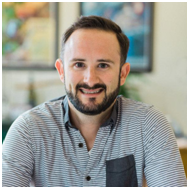 He is the founder of Credo, a marketplace to connect businesses with the right marketing professional to help them grow. He is also a San Francisco based growth marketer. Formerly the lead growth manager at Trulia Rentals, head of marketing at HotPads, and head of and senior consultant at Distilled NYC, he has also run Destinee Media in Switzerland and worked in-house in online education. Bala: Thank you very much for joining us with Mondovo Today. It’s a pleasure having you. Tell us who you are and what you do? John: Yeah for Sure. Thank you for that. It’s my pleasure to be here. My name is John Doherty and I am a SF, CA based entrepreneur, growth marketer, business coach and I do all sorts of things. My main hustle is GetCredo.com. It’s a marketplace that makes businesses working to grow with digital marketing consultants and agencies. That’s my main thing. I also consult with some businesses mainly marketplaces but some other businesses as well and how they grow their businesses. And I work with some agencies owners about how they solve their businesses, how they get better leads, how they grow their agencies. So, I work for digital marketing for years now, agency side… in-house… from huge clients, small clients, and seen a lot of it and, now I’m sharing my knowledge. Bala: Fantastic. Very good. Credo – The Marketplace, sounds pretty interesting. Could you tell more about it? John: Sure. Credo started about three and a half years ago under a different name, originally called as HireGun. I let it wobble for a little bit. I started it because, basically I was getting out of freelance consulting myself. And then I thought it’s somewhere good to send my clients. And so I literally started putting together a Google doc of a list of the people that I knew were good. And then it came like a light bulb went up in my head, ‘Why not people will be willing to pay for these leads’. And then I pinged my buddy Brandon, he was like would you buy us for 50 bucks? He said: “Ya absolutely, what’s your Paypal”? So, 3 minutes later I had 50 bucks in my Paypal account and sent him the leads and he was like HUH….helpful.. So, I literally then bought the domain name and tossed up on some hosting sites – shared hosting I already had. So, we got started from there and looked back at the original site and it was just like a gizmo I’m embarrassed by it but if you’re not embarrassed before it’s too late. Then I did a proposal on the site and then went in-house and evaluated where my site is doing it wrong? Something like 100 bucks a month in revenues maybe just kind of there. Maybe embarrassed about the site. And back in September, I changed it and bought it myself. And I branded it by January, since then I did focus on the marketplace where we focus on generating more high quality leads. I want to keep the lead quality super high. Nothing like $100 a month for SEO and things like that. Real businesses that needs real consultancies and agencies to help them build their business. I have also upgraded to a subscription model. And so basically I’m running a SAAS business as a virtual lead generation business. It’s super fun but I really enjoy where we are today. Bala: Fantastic. I did look into Credo and I did see a very good agencies listed there. Very good consultants and freelancers are also listed there. It’s got to be a right place to find them. That’s of course where we have all the consultants, freelancers and agencies. But Credo must be doing something to attract the business owners also right? So, how do you attract the business owners to Credo? John: It’s a great question. I get this question a lot. And I love giving the answer because I’m not doing anything special. People always want silver bullet. They always want like, ‘oh you just one thing all and you going to have six figures in your business, right?’ Six figures in business yes, I’m doing nothing that I always help people to do. Right? I’m doing SEO, I’m doing SMM, and then I’m doing local pages like Facebook stuffs, promoted post and that sort of things. I’m doing email marketing. Interviews and guest blog post, and that’s what helps in passive marketing and promotion. Doing all these things to build referrals to build the organic traffic and build a real brand. I’m not in it for a quick gig, build it and quit it. We’re going to build a real brand that people know and people trust, I’m doing all these things I’ve been doing for years. I’ve been doing for clients; just now I’m doing it for myself. Bala: Fantastic. Quickly trying to understand that they are two different audiences that you already have for Credo. One side you have been attracting the agencies, the freelancers and consultants and on the other side you mean to have a different messaging for the business owners to come and search for them and choose one of them. It’s going to be two different strategies don’t you think and how do you balance that? John: It’s a great question. Honestly, I’m still kind of working through it myself. So, on the business side, on generating the lead side, it’s really getting myself in getting Credo where the audience is. Guest content and interviews and all sorts of things which is kind of building the referral traffic. Another strategy that’s worked really well for me is getting the agencies. Yes, so you are asking about how to pursue the two sides of the marketplace Right? On the one side, there’re the pros that agencies and consultants etc, want to get onto the platform. The initial kind of group, I invited myself and now I kind of built a big wait list of agencies and consultants that are interested. And so now, it’s showing them the value of the platform. How many leads are they getting, what kind of leads are coming in, what they can do with it, proving the ROI to them. That’s a big one on that side. And honestly speaking of competencies as such really works. It’s kind of nice that people on the business side that are hiring these pros are also marketer themselves. So, they are getting the same content as the pro’s getting to work. So, some of that actually makes it little bit easier. But we need to have different content target for in-house or business owners or professional marketers or consultants. Different channels work better for different ones. The pros side is much longer kind of cycle then the business side. The business side is more of B2C play just trying to generate as many high quality businesses looking for growth to come to my platform. Bala: Perfect. Fantastic. That’s pretty interesting to know. When I looked into your site, not anybody could directly go and register in Credo. You have your own criteria of selecting them. That’s why I want to ask you when someone’s looking for a professional help. How do you recommend going about qualifying an agency or consultant? John: It’s a great question. I have already written content about this on the credo blog and also on my own site Johnfdoherty.com. But I actually published a blog post yesterday, more talking about the communication but that’s a big part of it as well. The real thing that businesses should look for are, either they have experience within their vertical and every pro on Credo can put how many verticals they have experience in. Real estate or fashion and also the business types because doing SEO for B2B SAAS website is very different for doing it for a 20 million page e-commerce website. So some of them might have worked on small businesses but when it comes to working on enterprise businesses, there are very different skill sets. It’s really asking those sorts of questions and figuring out if they already have experience working on the problem that you’ve faced. A big one of course is asking for references, case studies and those sorts of things. If they don’t have case studies, references, endorsements, from their clients, you really need to question are they really doing a good job? If agencies don’t have case studies from their clients, you really need to question, are they doing a good job? And then of course budget considerations always come into play. One of the things I’m trying to do with Credo is to bring more transparency to the industry. So that’s around, how much business is charged not just per hour but what’s the minimum? When I was working in New York City for a fantastic agency, their minimum was barely high. There were business coming to us for $2000 a month and to them we say ‘We can’t take you. You can’t afford us.’ As much as we would like to work with you, that’s not the kind of clients that we would take on. And so, it’s frustrating for the business, just trying to find someone, they are just trying to pass around and maybe talk to so and so. That’s another one and it kind of starts there, can you afford them? If you can afford them, do they have been experienced within your industry, within your protocol, that sort of it. I think the biggest one that businesses overlooked is communication and how well the consultant or agency communicates with their clients, how well is their report and that kind of things. Those are all very important to the health and long strategy and success of the project. Bala: Perfect. Well said. Apart from the minimum price of the clients you’ve been working for, is there any other thing like agencies should bother in qualifying the client itself? John: Absolutely, it’s a two way street for sure. Some of the things that consultants or agencies need to look for are – do they have ability to get things done internally? They’re coming to you looking for say an SEO audit, they want a technical audit, but they don’t have any people internally who can actually make the changes. Why are they hiring you to do that? Right, maybe they’re caught up. They want to go up higher and higher to some web development agency or something like that which is fine but you just need to make sure and that’s the question I always ask. What sort of resources do you have? What sort of people do you have in order to implement this stuff. If they don’t implement it, you’re not going to see any movement and it won’t be a successful project for them or me and you as a consultant. A few things that consultants & agencies need to look for are – do they have ability to get things done internally? That’s the big one that’s often overlooked. Also communication right? When I’m talking to a potential client, if they are not getting any communication, if they are not getting back to me, if they are not talking on the phone call, some people might be okay with that but personally, it’s super annoying right? I schedule all my day, puts them all on my calendar, someone says like okay I can do with call at 10 AM and they are not there and reschedule for the afternoon. That does happen from time to time. But if it’s a consistent thing where they don’t want scheduled meetings and all that, I know it’s not a good fit for me. Learning how you work well and then making sure that the clients are on the same wavelength as you. And of course you know, are they faulting at budget, are they not going to pay you. All these sorts of things you have to deal off. Bala: Well said. 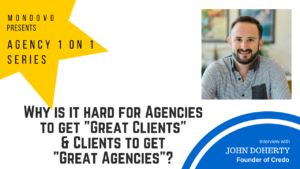 John, you know in these industry especially when I talk to most of the agencies, commonly what they have is despite qualifying them and giving them the proposals, the number of people, who get back, is very minimal. According to you what is the common pitfall or mistakes these agencies make and how to avoid these mistakes? John: Great question. I see a bunch of agencies pitching a lot of different work. I can see a lot of proposals from a lot of different clients too. I think, the biggest one is not immediately trying to schedule a follow up call to discuss the proposal on the phone. A lot of people will send you the proposal and say like, ‘let me know if you have any questions.’ They shouldn’t have to have any questions, you should have done the work ahead of time to know the kind of project that they want. And you’re kind of announcing that against your expertise and what you think they need. So I think that’s a big one where one of the most common things that I see. So many people don’t do is actually talking to them, discussing it. A lot of people just want to skim through, a link to dropbox document or something like that and say ‘Let me know when do you want to get started? And you are like, you haven’t heard my business yet, you haven’t built my trust that you can actually do it. Within the proposal, a lot of agencies are actually really bad in telling the potential client what they are going to get with their money. They’re not concerned talking about the results. They can’t really guarantee results. Especially in SEO, marketing, especially when you’re relying on someone else to get it done. They might have been wrong or they might have not done it for a long time. We can never guarantee results but you can tell them like these are the deliverables’ you’re going to get, at this stage you’re going to get the technical order. At this stage, you’re going to get this keyword research, we’re going to do this content strategy for you, this is the promotion that we’re going to do. Actually telling them what they’re going to get for their money. You take a $2000 of proposal to your boss and say ‘I don’t know if you’re going to do SEO for us. I don’t know if we’re going to get’. I think agencies and consultants need to get better about the kind of project upfront. Bala: Setting the expectations right. Perfect. Fantastic. John, I looked into your whole profile. The work starts that you’ve been working with I presume that you’ve been working a lot with HotPads there. You had a great time there. You want to share something about that? John: Yes sure. HotPads is a brand started and acquired by Zillow, the largest real estate website and company in the United States. They were acquired by Zillow about Dec 2012 and I joined them in Oct 2013. As a first marketer for 2.5 years. Fantastic team of engineers. They didn’t have any marketing and so I was kind of brought on to fix some traffic issues, help in their SEO and build a team. And so over there, did that, turned traffic around, started heading out in the right direction. But lately, then hired a team of content PR, SEO, inbound marketing and link building. That was really fun working on a brand that’s been around quite a while. They already had people that loved it. They love the product, they love the service, it was a great product. When I was there, the team re-skinned it, the front-end CSS refresh, and people are like, wow this looks amazing. It’s super usable. And we were able to do some cool content as well, like, telling stories about the rental market, targeted directly at our target audience. For me, that was really fun because I was able to get out of being a quote-unquote SEO guy. I was already moving in that direction and working with clients with these still on content marketing, and storytelling and all that sort of stuff. But it was really cool to be able to find user targeted audience or personas who we are really going after, what really makes sense for our business, brand positioning and all that sort of thing. And then working with another team on strategy and executing that strategy to actually get that target audience. So it’s all like we started to get breakthrough. The team was fantastic. And we had really really cool days. Bala: That’s pretty interesting to understand. You’ve personally have seen both side of thing. You worked for an agency and worked with a team, perfectly went well with them. And also you’ve worked with as a freelance consultant also. So, you do understand that there are some common mistakes the clients are always make. What is that you have seen as common mistakes clients normally make? John: Ah man. You got good question. Some of the common mistakes that I see clients making are like not having a strategy in place. They make money but they don’t know why they make money? Or how they make money? They just know that they’re doing, they don’t know how they increase revenue, they don’t have a set strategy in place for the X number of years, this is what we’re doing. Businesses make money but they don’t know why they make money or how they make money? These are the different things that we are testing and which is why probably why they hired a digital marketer. This is why they’re bringing us in. But a lot of businesses are very reactive and not proactive. It’s a challenge for professionals, for consultants as well. So I think about marketing consultants especially SEO consultants, like Dentists. So Dentists only see their clients, when a client has a tooth ache or something like that. There are very few that come to them every six months or a year for checkups. And most of them come when they have this pain in their tooth. So they got to do that triage or something like that and then hopefully then you can be very pro-active. When it comes to marketing, a lot of clients I think are very reactive instead of proactive. And that’s why I want to see a shift in businesses. I want people actually be thinking long term about, this is how we grow businesses as opposed to looking for those silver bullets. Yeah and as far as specific technical stuff or common things that I see people doing wrong or no one sure about site linking. They aren’t checking for SEO in a right way. They don’t have the sitemaps, a number of times they don’t have the right canonical. A number of times, I have seen are like some huge websites, I’m talking like 10 million 20 million page websites, It amazes me that people still can’t get this right. Bala: Alright. It’s very important to educate the client most of the time and then proceed on. Let’s talk about some of the achievements that you have actually done with being a freelance consultant or being in a team. Let’s talk about the numbers and what about that you did exactly in order to help them succeed and what is the process? Let’s go through that quickly. John: Yea, for sure. One of my clients 2 years ago, a big hotels chain. They are having issues with SEO. This is where I learnt a big lesson about having resources to implement things. Because we were doing a technical audits and keyword research and that sort of thing. They weren’t really about executing against it. They hired one engineer to work full time, work on SEO changes, but one of the things that we started doing was adding a lot of content to their main category page. And fixing a lot of their crawl issues, and internal linking and all of that sort of things and took a lot of their main keywords, all the main terms that they wanted to rank. Like fourth or fifth page to the bottom of first page. That’s huge keywords for a hotel’s website. That was super fun. To be with the testing and being able to say we added a lot of content to these pages. This is the set we added to and this is the set we didn’t add to and this is how the changes happened. The set we didn’t add to, we grew up about two places for about 3 months. The set we did added to went up 70 places. So that’s astronomical difference but we were able to justify spending 300 bucks a page to build out this content because we we’re going to see astronomical increase. There are obviously a lot more things to do to be able to get to the top of the first page and bring real traffic but that got us to a place where we can start investing that. At hotpads, It was really interesting, one of the biggest thing was they did an okay job with internal linking but we drastically increased the internal linking and linking to nearby cities and towns, in a really smart way. One of the coolest things we did was we took all of our cities and neighborhood, got their search volume, right apartments for rent in city and apartments for rent in neighborhood and then we are able to we expanded it to within 50 miles, pick the top 3 highest volume cities and link to those, and then we do at the seven closest nearby neighborhoods as well. So we were really able to spread the wing technically down to the site. As we are building links to our neighborhood cities, they just saw an explosions in long tail traffic, two cities, not just like Chicago page for example but and Chicago page and all of its neighborhood. Bala: Very good. How long did it take to complete the process? John: Six months. From ideation, data gathering, we had to get data from other places, implementing it, making sure everything is working correctly, getting sitemaps getting all the tracking in place and then continuing to build links and do content and all that sort of things. Yeah, that was probably five or six months worth of work. Bala: Very good. Fantastic. Alright, let’s talk about your biggest failure and what did you learn from that? John: Biggest failure, hey that sends some cripples around me, I wasn’t expecting here! But, biggest failure was…. I’m to say it’s been with Credo, cause a week ago, we pivoted that to a different business model now. Before that, it was a lead generation business where basically I would, sell lead to some one and if they close it they pay me a percentage as commission. 50/60% of leads were closing. For different reasons, I tried to go in a different direction or whatever. Basically I was talking to a business coach; he was like ‘your strategy is built on hope right now and that’s not a strategy. You do this work upfront hoping that you will get paid. That’s not a strategy and you need to realize that.’ There are huge holes in my quote-unquote business model. I really wasted a few months of time doing that as opposed to going in the direction I am going now. After putting this pivot a week ago, I wish I had done this 3 months ago. But yes, these are common mistakes that entrepreneurs make but it’s definitely one that I have been thinking about a lot. Also, there was a time, I’d have a client (doing technical SEO issue) who was building out a new website, and they wanted to go live with it and basically I forgot to tell them super specifically step by step how to roll it out and they ended up pushing their test sites on their test URLs and they ended up redirecting their live website which I think that was ranking and that’s a huge multi-million dollar company, redirected their live site to their test URLs and left the test URLs to no-index. So he called me up the next morning and saying, ‘We’re not ranking for our brand name’. And when I looked at it – Well, that’s because you did this. Of course reverted it and they were back to ranking with an hour for their brand name. But when you get a call from a huge client saying they are no longer ranking for their brand name, you know that’s a failure right there. Bala: Right. Fantastic. Thank you very much. We have a last question for you. At Mondovo here , we’re planning to have a section where we’re going to be listing agencies, under various geographies as categories. Of course, the motive is allowing businesses to easily find out that the right partner and then start working. In your experience, like of course you have started with Credo and you have learnt a lot of stuffs. What do you think geography does even matter when selecting an agency or freelancer? Do you think that even make sense for professional categorization by locations for this kind of business? John: Well, it depends on the business, honestly. I think for someone looking for a consultant, it really does matter, because they want someone in person right. My clients, the clients with whom I work right now or all in SF, they want a SF based consultant. Yes, I think it does make sense for some but it make less sense if it’s a multinational business, it doesn’t really matter right. They are not really paying you to travel there. If it’s a smaller business, location does matter. I’m actually working on rolling out pages for all the locations I have and that would be located on Credo. So yea, I definitely think it’s worthwhile. Bala: A person for an SEO work, for a company management or something like that they’re okay with somebody working on their site from anywhere or any part of the world. Something which comes to more strategy work, they want to see somebody’s there who’s in their city talk to them face to face that close the deal. Doesn’t it? John: Totally, that face to face is really super important for them. I would honestly say may be 10% of leads that are businesses that have come to Credo actually looking for someone have asked for specifically, like I am looking for someone based in Denver, Colorado for example. Most of them, they don’t care where they are. They might care about time zone but even then most of them don’t care, as long as they can do the work, we can make it happen. Bala: Right, Fantastic. Alright. Thank you very much. Really appreciate for your time. Look forward to be talking to you for some more sessions and very good luck with Credo. John: Absolutely. Thank you very much. It’d be my pleasure to be there. An informative read indeed. Well, I don’t have much to add but would just like to expand a bit on one of the key snippet that you have mentioned – Agencies don’t follow up enough after a proposal/pitch. Back in 2015, when I was starting my agency, quite a few agencies lined up in my inbox with fancy proposals and pitches but none of them could promise me the deliverables. Also, after their first mail, I didn’t hear from most of them except a few. So this is one area that I would like agencies to work on so that they promise a hassle-free customer experience.